Sought after, 7-day minimum rental community. 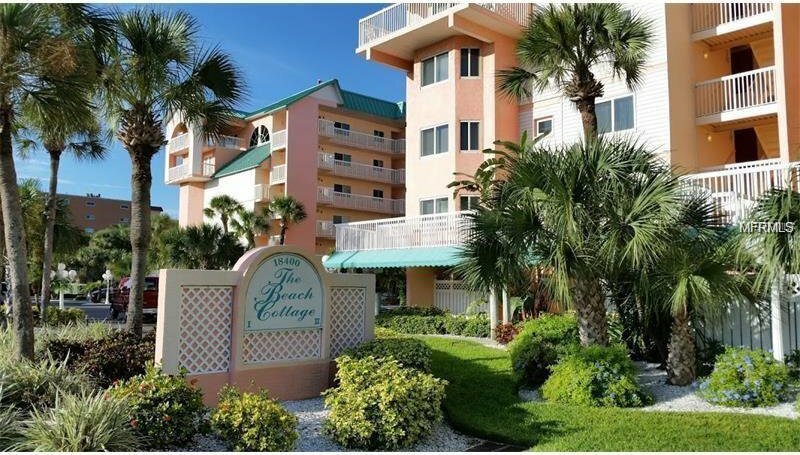 Top floor condo in building 2 of the Beach Cottages located right on the sand. Awesome water views from the kitchen, Living Room and Master BR. Spacious Master with King size bed, and a nice size guest room with twin beds. Master bath has a large, beautifully tiled walk-in shower and the guest bath boasts both tub and shower. Living room has an electric fireplace, a sleeper sofa and will lead you out to the balcony for incredible Gulf views, beach views, view of the pool and lounge area and WOW the sunsets are phenomenal. Unit has an under-building parking space, and there is an abundance of guest parking. Kayak storage in the garage area, a heated pool/spa on the large pool deck with gas grills, a shower and restroom facilities. Condo has storm glass slider and window. There is a storage room on the balcony for your beach accessories. Unit is offered fully furnished/turn key with nice appliances, a stackable washer/dryer in kitchen, flat screen TV, and lots of décor. Nice community heated pool and spa, BBQ Grills on lounge area by pool, outside shower, pool restrooms, car wash area and more. Close to shopping, restaurants and easy access out to I-275. This unit is not to be missed if you’re searching for a property that offers an outstanding short or long term rental clientele with high dollar return or if you’re looking for a waterfront home as your permanent residence. Listing courtesy of SMITH & ASSOCIATES REAL ESTATE. Selling Office: COASTAL PROPERTIES GROUP.